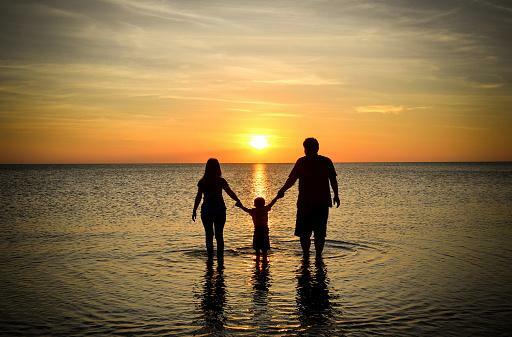 With its wide open space and clean background, the beach can be the ideal place to do your family photos. There are endless choices when it comes to light, posing, and style, so it's a good idea to narrow down your options before you do a photoshoot. 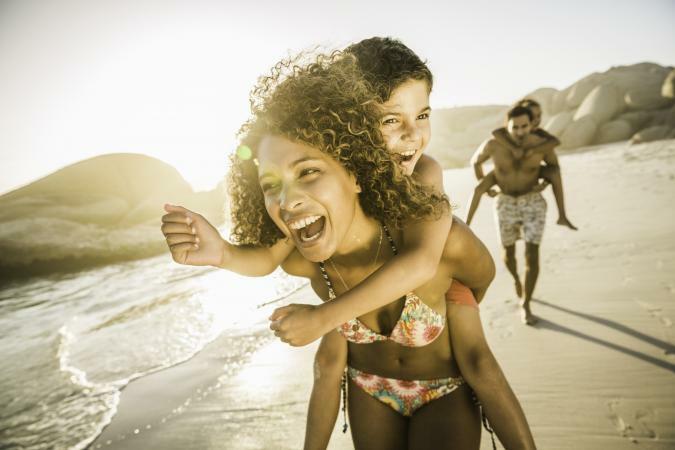 The beach is more than just a place to look at the camera and smile; it's also a great location for capturing your family in action. Try having the whole family run straight at the camera, jump at the same time, stage some piggy back rides, or even fly a kite. This is a great opportunity for lifestyle shots too - images that aren't posed and just show your family enjoying themselves together. The simple background of sand and sky means you can use a small aperture and have plenty of depth in your shot without distracting elements. This lets you keep everyone in focus, both near and far from the camera. This is also a time to use autofocus. Manual focus is wonderful for some lenses, but it's not awesome for tracking moving people. Set your camera to continuous shooting, using the highest speed it has. Take tons of shots to give you plenty of choices. Keep your shutter speed up. While 1/250 second will generally stop the action in a moving person, it may not be enough to freeze splashing water and people running really fast. Bump it up to 1/500 second or even 1/1000 second if you can. Your first thought with beach shots may be to capture that golden sunlight, but you can actually have even more success on cloudy days. You'll get soft, diffuse light that can lend a dreamy feeling to the family portrait. Shooting on chilly days also lets the family bundle up together with coats, sweaters, or even blankets. Because you're not dealing with direct sunlight, you can shoot at any time of day. Try wearing pastels, whites, and greys. The light clothing and light background can combine to give you a soft color scheme that feels really fresh. Even though it's overcast, look to see where the light is coming from. Turn everyone that direction to light their faces properly. Take advantage of the wind. Let hair or blankets blow a little to show movement and really underscore the beach environment in the shot. Experiment with exposure. You can change the mood of a shot by lightening up a bit and letting the sky overexpose a little. If you're not set on showing everyone's faces in your family photo, try out a silhouette. This also works as another image in your shoot after you've taken some other shots and the sun is setting. It's a great way to display connection and love while showing off the beauty of your gorgeous setting. This should be a wide shot with lots of sky and sand. Use a wide angle lens, such as a 35mm, or take some steps back to take in the whole scene. Underexpose this shot. You want the sky to be properly exposed or even a little underexposed, and the figures will be totally dark. Try some different poses. Hold hands, jump together, or swing a child over the waves. Make sure people are connected in some way but are also far enough apart to show their distinct shapes. Experiment with using a smaller aperture to take in more depth. You may get shadows or reflections on the sand or water that way. 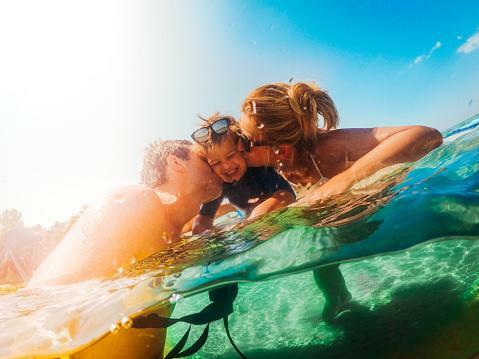 The beach makes a great background for family shots, but you can really take your beach photos to the next level by getting everyone (including the camera) in the water. There are many products available, such as the DiCAPac Waterproof Case, that let you bring your camera into wet environments, or you can use a waterproof camera. Keep swimwear simple. Too many bright colors and patterns can detract from the focal point of your image: your family having fun in the water. Use a fast shutter speed, at least 1/1000 second, to capture those drops of water in mid-air. Play around with having the camera underwater or partially underwater. This will make the person viewing your photo feel like they are right in the action. Shoot with the sun low on the horizon and behind and to the side of the people. This will backlight the water and make it stand out, but it won't blow the highlights with light that is too bright. 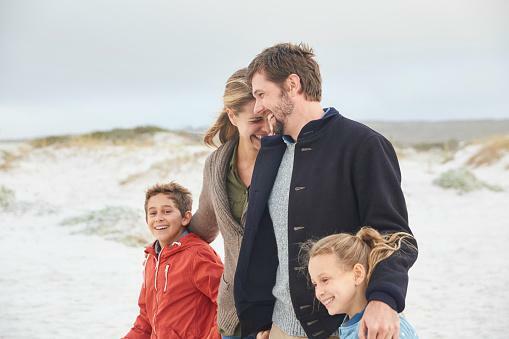 No matter how you set up your beach family photo shoot, make sure you capture what's important: connection and fun. If your shots have real emotion, everyone will love them.